June 11, 1997, barely missed being one of those dates people remember ruefully, thanks to the event that might have made it memorable beginning while most Americans were asleep and ending before they woke up. The event, a lightning strike disabling the only extra-high voltage transmission line bringing electricity to Wisconsin from the west, could have darkened seven states and part of Manitoba had it occurred 12 hours earlier or later. Luckily, the strike came at about midnight, with slack electrical demand, and the system compensated for the loss of interstate power transfers with no one except utility control-room operators knowing about it until after the crisis had passed. But the conditions that made a crisis that late-spring night were lurking all day, every day, ready to trigger what would at best have been huge economic losses, and remained a defining characteristic of Wisconsin’s energy infrastructure for years. Today, Wisconsin’s electric grid is backed by generation capacity above the mandatory reserve margins and a robust transmission network allowing in-state energy producers to bid their output into wholesale markets reaching from the Gulf of Mexico to Hudson Bay. How it got that way is a story of this state’s response to the reality of our grid’s condition in the 1990s, perilously close to the opposite of what it is now. 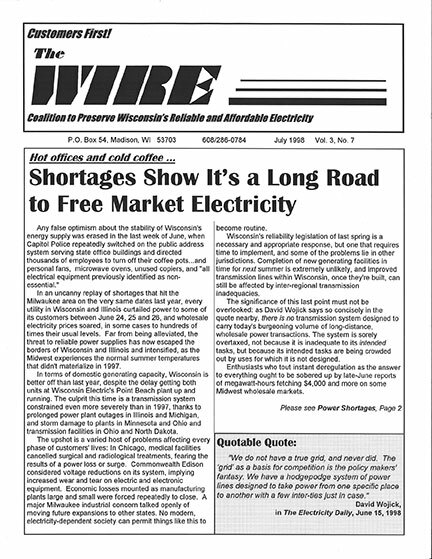 Twenty years ago this month, utilities were sounding the alarm: Eastern, and especially southeastern Wisconsin had little chance of getting through the weeks ahead without large-volume electricity users having to cope with service interruptions that would be weather-related only in the sense that it gets hot in the summertime. Rolling blackouts—portions of utility service areas taking turns going without power for an hour or two—were a real threat. The obvious cause for concern was the unavailability of Wisconsin’s nuclear plants. The single unit at Kewaunee shut down the previous September for extensive repairs. A month later one of two units at Point Beach went off-line for refueling and maintenance, and in February 1997, the other Point Beach unit shut down for repairs. All three would be off line through the summer. Normally, Kewaunee and Point Beach were producing one-fifth of all in-state generation. A subtler concern was limited ability to import power from other states. On any given day, about 15 percent of the electricity used in Wisconsin was produced elsewhere. More would have been imported but interstate transmission connections were too few. Even within the state, transmission between western and eastern Wisconsin was frequently constrained. Near Stevens Point, the transmission line knocked out by the June 1997 lightning bolt joins the eastern Wisconsin grid. Twenty years ago it was not just the only interstate connection to power imports from the west, it was the only large-capacity link between the two sides of this state. 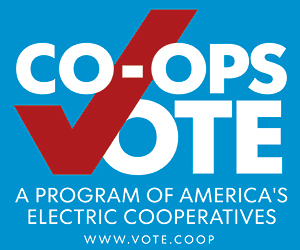 One practical consequence was even with surplus capacity on the Dairyland Power Cooperative system at crucial times of day (Dairyland and eastern Wisconsin utilities had different hours of peak demand), the Dairyland surplus couldn’t shore up reliability in eastern service areas because the single transmission link was too congested to move additional power. On five days in June and July 1997, the Wisconsin Electric Power Company shut down tens of thousands of Milwaukee- area air conditioners, and dozens of local industries sent workers home because there was no electricity to run their operations. On July 24, Governor Tommy Thompson convened a meeting with utility officials and within days formed a task force to develop legislative recommendations for construction of new infrastructure. A bill was introduced in January 1998 and signed by the end of April. 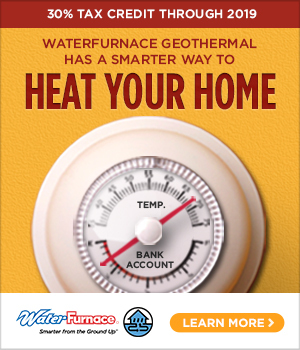 But because of the long planning and construction timelines for even modest-sized utility projects, when hot weather returned on June 24, 25, and 26, every regulated utility in Wisconsin and Illinois curtailed usage by customers with interruptible contracts. Many legislative employees spent most of a week working in Capitol offices with the lights turned off during a summer heat wave three years earlier. Reliability legislation facilitated approval for 500 megawatts of new generation and building transmission lines. In 2001, the Waukesha-based American Transmission Company (ATC) was founded as the nation’s first stand-alone transmission utility. This spurred construction of a second transmission link to the west, though—as if to underline the industry’s lengthy planning horizons—it took until 2008 to energize the line between Duluth, Minnesota, and Wausau. Even so, it was finished ahead of schedule. A third western connection has since been added. It will be extended to the Madison area by next year. A fourth is in the planning stages. In 2013, ATC added a fourth high-capacity link to Illinois, where three existed in 1997. Public Service Commission approval for another is expected in the fall of 2018. Equally important, numerous projects wholly within Wisconsin now help move power between one part of the state and another, allowing more efficient deployment of in-state generation and reducing the risk of a single lightning strike shutting down wide areas. Ironically, 20 years ago the inadequacy of Wisconsin’s grid prompted frustrated manufacturers to demand retail electric competition, impossible to achieve with both inter- and intrastate transfer capacity too weak to allow consistent access to alternative suppliers. Now, with the system gradually strengthened since 1997, the physical prerequisites for a competitive retail market might actually be met, only to have the intervening 20 years demonstrate that retail deregulation more often than not leaves consumers paying higher prices.